Since we have started tracking the gender pay gap, the difference between the earnings of women and men has shrunk. But significant disparity in how men and women are paid still remains. The uncontrolled gender pay gap, which takes the ratio of median earnings of all women to all men, decreased by $0.05 since 2015. However, women still make only $0.79 for every dollar men make in 2019. What often gets lost in translation is what the uncontrolled wage gap truly represents — that women are less likely to hold high-level, high-paying jobs than men. There are structural barriers which keep women from advancing in the workplace– this is what we call the opportunity gap. 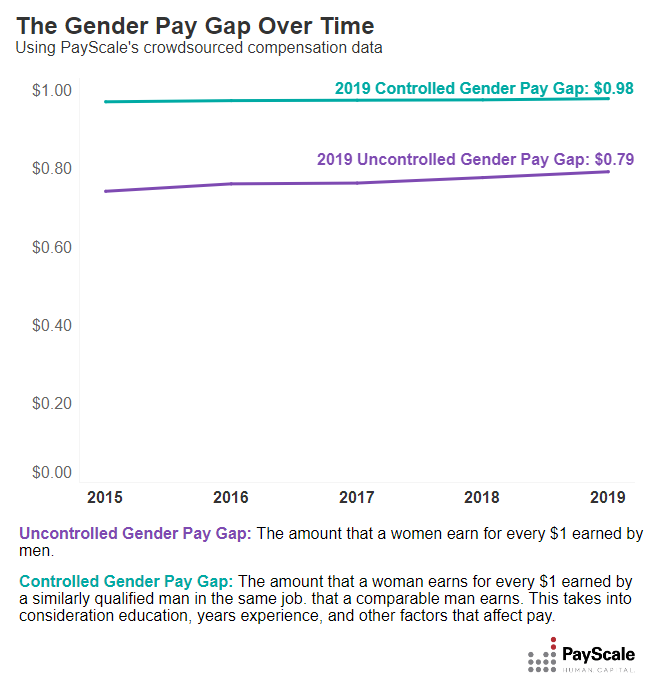 The controlled gender pay gap, which controls for a number of factors such as job title, years of experience, industry and location so that the only differentiation between workers is their gender, shrunk by just $0.008 since 2015. Women now make $0.98 for every dollar an equivalent man makes. Additionally, when we discuss the gender pay gap, it’s important to remember that women are not one homogenous group: women of color face a different set of barriers in getting fair pay and advancing in the workplace compared to white women. This year, we took a close look at the intersection of gender and race and examined how the gender wage gap differs for women of various races. We also examine the opportunity gap for women of different races. Last but not least, we’ve created a guide for HR professionals and business leaders who seek to close the gender wage gap and make their workplace more equitable for all employees. Between January 2017 and February 2019, nearly 1.8 million people took PayScale’s online salary survey, providing information about their industry, occupation, location and other compensable factors. They also reported demographic information, including age, gender, and race. We leveraged this sample to provide insights into the controlled and uncontrolled gender pay gap. For analysis by race, we look only to those with at least a bachelor’s degree. All gender pay gap numbers reported are relative to white men. In 2019, women earn 79 cents for every dollar earned by men. This figure is representative of the uncontrolled — or “raw” gender pay gap, which looks at the median salary for all men and women regardless of job type or worker seniority. In other words, the median salary for men is roughly 21 percent higher than the median salary for women. This figure represents a one percent improvement from 2018 and a 5 percent improvement from 2015, when the median salary for men was roughly 26 percent higher than the median salary for women. What is the gender pay gap once all compensable factors such as experience, industry and job level are accounted for? It’s still not zero. In fact, when men and women with the same employment characteristics do similar jobs, women earn $0.98 for every dollar earned by an equivalent man. In other words, a woman who is doing the same job as a man, with the exact same qualifications as a man is still paid two percent less. Unfortunately, this controlled wage gap has only shrunk by a miniscule amount of $0.008 since 2015.
with the same job and qualifications. There are significant variations in the size of the wage gap for different ethnic groups. The largest uncontrolled pay gap is for American Indian and Alaska Native, Black and Hispanic women. Women who identify as a member of these races earn roughly $0.74 for every dollar a White man earns. In other words, American Indian, Alaska Native, Black and Hispanic women earn 26 percent less than White men. This gap is smaller than that reported using the Current Population Survey, likely because we’re only studying respondents with at least a bachelor’s degree. For reference, the uncontrolled pay gap between White women and White men is $0.80 on the dollar. Equal Pay Day was started by the National Committee on Pay Equity (NCPE) in 1996 to highlight the gap between men and women’s wages. Equal Pay Day is held every April to symbolize how far into the year women need to work to make what men did in the previous year. However, this date is calculated using the overall wage gap, the $0.80 on the dollar figure. Equal Pay Day for Latinas and Equal Pay Day for Black women are later in the calendar year, because these minority groups typically earn less than White women. According to EqualPayDay.org, the typical Black woman must work until August 2019 to be paid what the typical White man was paid at the end of December 2018. The typical Latina woman must work until November 2019 to be paid what the typical White man was paid at the end of December 2018. The controlled pay gap differs by race too: The largest gap is between the earnings of Black women and White men. Black women make $0.97 for every dollar a White man with the same qualifications makes. The controlled gender pay gap for Hispanic and White women is more or less the same. Both groups earn roughly $0.98 for every dollar a White man with the same credentials earns. However, this does not mean that Hispanic and White women are necessarily treated equally in the workplace. In fact, we find that women of different races face various degrees of discrimination when it comes to getting fair compensation for their work. Why is the uncontrolled wage gap so large? It’s because women are less likely to hold higher-level, high-paying jobs compared to men. Women also tend to move up the career ladder at a slower pace than men. We call this phenomenon the opportunity gap. We’ve found that roughly an equal percentage of men and women start their careers as individual contributors, i.e. they do not manage people. At the start of their careers (age group 20-29), 74 percent of men and 75 percent of women are in individual contributor roles. However, a much smaller proportion of women reach the manager/supervisor level or higher by the middle of their career. By mid career (age range 30-44), 47 percent of men are managers or higher, while only 40 percent of women reach this level. By late career (age 45+), 57 percent of men are managers or higher, while only 41 percent of women reach this level. Few women ever make their way to C-suite. By late career (age 45+), eight percent of men have risen to an executive level position, compared to three percent of women. Occupational segregation also contributes to the gender wage gap. Data from the Bureau of Labor Statistics show that women tend to be overrepresented in occupations such as Healthcare, Personal Care & Service, Education, Office & Administrative Support, and Community & Social Services — typically lower-paying occupations. Meanwhile, men are overrepresented in higher paying occupations like Engineering and Computer Science. There are multiple reasons why women earn less than men and move up at a slower pace. For one, employers often make assumptions about what kinds of work different genders are best suited for, funneling women into lower-paid, lower-level positions. Another key factor is that women tend to spend more time out of the workforce, which hurts their career. In 2018, we studied this issue and found that when a worker leaves the workforce, they incur a wage “penalty” upon their return. Workers who took a break for 12 months or longer experienced an average wage penalty of 7.3 percent relative to a similar worker who did not take a break. Women take more breaks and longer breaks than men, primarily for taking care of children and aging family members, and bear the brunt of this “time-off” penalty. For more details, check out PayScale’s 2018 Gender Pay Gap report. To understand the opportunity gap for women of color, we must first establish the baseline. In our sample, 56 percent of White men were individual contributors (ICs). The proportion of ICs goes up to 62 percent for White women, 61 percent for Native Hawaiian women, 63 percent for American Indian women, 66 percent for Hispanic Women, 67 percent for Black women and 72 percent for Asian women. This implies that women of color are more likely to stagnate in their careers than White women. 72% of Asian women remain individual contributors. While only 3 percent of all White women make it to the executive level of an organization (compared to 6 percent of White men), only 2 percent of Asian, Black and Hispanic women make it to the C-suite. In other words, for the most part, women of color are facing even greater barriers to advancing in the workplace compared to White women. For the race portion of our analysis, we only looked at those who have at least a bachelor’s degree. Due to sample size issues, we’re unable to report data on Native Hawaiian and other Pacific Islanders beyond the manager/supervisor level. Our research shows that even at the start of workers’ careers, the playing field isn’t even. Our research found that White, female individual contributors (ICs) earn $0.81 for every dollar earned by a male individual contributor. This notable gap implies that men and women are segregated into different jobs early in their careers. When controlling for compensable factors, a White female individual contributor makes 1 percent less than her White male counterpart. Sadly, this wage gap is even wider for women of color. Black women, American Indian women, and Hispanic women at the IC level make $0.77 cents for every dollar earned by a white man at the same job level. In other words, women belonging to these minority groups make 4 percent less than White women and 23 percent less than White men at the same level. After controlling for compensable factors, we find that Black women at the IC level make 2 percent less than an equivalent White man. Hispanic women and White women at the IC level all make between 1 percent less than an equivalent white man. Interestingly, Asian women at the IC level did not experience any uncontrolled wage gap relative to White men. When controlling for compensable factors, Asian women at this level made 2 percent more than an equivalent White man. However, it is important to keep in mind that the demographic group “Asian” covers many different ethnic groups that are not treated equally in the workplace. The gender pay gap widens for all ethnic groups as they move up the corporate ladder, but not to the same degree. The largest controlled pay gap is for Black, female executives. A Black, female executive earns $0.63 for every dollar a White male executive earns. In other words, a Black female executive earns 27 percent less than a White male executive.This implies that Black women and White men work in vastly different jobs and types of organizations even when both hold senior positions. Even when we control for compensable factors, Black women who are executives get paid $0.95 cents for every dollar a White man with the same qualifications does. Additionally, we know that biases often seep into performance reviews and pay increase decisions and these biases disproportionately affect people of color. In 2018, PayScale conducted research to understand workers’ experiences when asking for a raise. We learned that all races are equally likely to ask for a raise from their current employer, but women of color were 19 percent less likely to have received a raise than a White man, and men of color were 25 percent less likely. Our analysis controlled for other factors that affect the likelihood of receiving a raise, like tenure and job level. Women with advanced degrees are under-utilized and under-compensated for their education. Wage gaps tend to be greater for those with more advanced degrees. Women with MBAs face the largest uncontrolled pay gaps, implying that men and women are segregated into different jobs. In our salary survey, we asked workers to respond to this statement: “I feel that I am paid fairly within my organization.” We find that the vast majority of workers do not agree that they’re paid fairly by their employer. Interestingly, women tend to have a more negative perspective on pay fairness compared to white men. This is true for women of every race. Feeling underpaid presents problems not only for the individual, but also for employers. An article in the Globe and Mail cites studies showing that feeling underpaid increases the probability that a worker will report experiencing “stress, depression and problems with emotions’ on a majority of days in any given month”. When a worker senses she is underpaid, it also breeds resentment. Both of these issues lead to absenteeism and loss of productivity. Additionally, we’ve found that perceptions about pay play a significant role in an employee’s desire to leave your company. For example, 60 percent of employees who perceived they were underpaid said they intended to leave, compared to only 39 percent of those who perceived they were overpaid. Women are underpaid relative to men for every occupation we examined in our dataset. Data from the Bureau of Labor Statistics show that women make up the majority of workforce in occupations such as Healthcare, Personal Care & Service, Education, Training, Office & Administrative Support, and Community & Social Services. Meanwhile, the vast majority of men are in occupations such as Construction, Installation and Maintenance, Architecture & Engineering, Computer Science and Transportation. It might feel logical to expect the gender pay gap to be smaller in industries that are dominated by women, and wider in occupations dominated by men. However, this is not supported by fact. In reality, there are multiple occupations in which women make up more than half of workers in that field, and are still paid significantly less than their male colleagues compared to more male-dominated industries. Take the legal industry as an example: women make up 52 percent of workers in the legal profession, and yet face the greatest uncontrolled pay gap of all occupations covered in this study — making 62 cents for each dollar earned by men. This finding implies women and men in the legal profession do not have the same job levels or job titles. When we look at similarly situated men and women in the legal profession, there is still a wage gap of 2 percent. Sales is another occupation in which the uncontrolled wage gap is significant. Women make up 49 percent of all workers in sales but make $0.80 for each dollar earned by men. When we look at similarly experienced men and women in sales, women still make $0.96 for each dollar made by men. On the other hand, community and social service occupations are closest to having pay parity. The uncontrolled pay gap for these jobs is $0.96 on the dollar, meaning women on average get paid 6 percent less than men. However, the controlled pay gap is essentially non-existent. While technology does not have a good reputation for being female-friendly, it has the smallest controlled pay gap of any industry. However, there is a large difference between the controlled and uncontrolled gender pay gap in technology. Among other things, this is indicative of the fact that women and men do not have the same jobs within tech. Also, women make up only 29 percent of the tech industry. The transportation & warehousing industry has the largest controlled gender pay gap of all industries, followed by energy & utilities, and accommodation & food services. The largest difference between the controlled and uncontrolled wage gaps is in the finance & insurance industry. Alabama continues to have the largest uncontrolled gender pay gap in the country, with women making roughly 27 percent less than men. Alabama also has the third largest controlled pay gap, with women making 4 percent less than men with the same qualifications. Alabama’s next-door-neighbor Louisiana does not do much better. Louisiana’s uncontrolled gender pay gap shows that women are making 25 percent less than men on average. Louisiana actually has a wider controlled gender pay gap than any other state, with women making 5 percent less than men even when we control for compensable factors. Vermont takes the title as America’s most equitable state. It has both the smallest uncontrolled and controlled gender wage gaps. Women in Vermont earn 13 percent less than men. But when we control for compensable factors, they make roughly the same as men. Our research shows that gender and racial biases and discrimination are both far from uncommon in the workplace. Women are often undervalued for the work they do, are more likely to hold lower-level, lower-paying jobs and they tend to stagnate in their careers. Women’s experiences in the workforce vary vastly by race: We see women of color often face additional barriers to advancement compared to white women. For example, Black women and Hispanic women experience even wider pay gaps, they start out their careers in lower paying positions, and are even less likely than White women to make it to the C-suite. Additionally, as much as employers try to position themselves as a meritocracy, we find that pay decisions do not reflect a merit-based culture. Employers do not value education/degrees equally among men and women. Our data shows that employers tend to undervalue degrees when they’re earned by women: employers pay women less than men at every education level, after controlling for other compensable factors. The women with a masters of art, MBA and/or law degrees are under-utilized and under-compensated to a greater extent compared to women who have only a bachelor degree. Even if you’re not running a company yet, there are still things you can do to make strides towards closing the pay and opportunity gaps. Check out this article for some practical tips. These days, employers no longer have an option to ignore potential wage and opportunity gaps within their workplace. Not only are there new equal pay laws that organizations must comply with nationally and globally, workers themselves are demanding change from their employers. For example, workers in 2018 took to the streets and courtrooms to fight against perceived cases of pay discrimination (Google, Nike, Oracle). Addressing pay equity issues isn’t just a matter of compliance or protecting one’s reputation. In today’s tight talent market, workers are choosing to align themselves with organizations that have values that match theirs and fairness is a value most workers identify with. Organizations which commit to examining their pay and rewards practices to ensure fairness will position themselves well in the war for talent. The opportunity that lays ahead is not about complying with equal pay laws. It’s to ensure that your workplace is fair to all workers and as a result, differentiate your organization as an employer of choice. We’ve put together a step-by-step guide for business leaders and HR leaders who want to ensure equitable pay, equalize employment opportunities and see more equitable outcomes for all people within their organization. Get your copy today. When you get compensation right, you attract and retain the best talent.